These DIY bridal shower invitations are so creative – and I love the sentiment behind them! As a bridesmaid in her cousin’s wedding, Joy Ang wanted to create a memorable invitation experience for guests at her cousin’s bridal shower. After a bit of thought and experimentation, Joy came up with these tea bag invitations that fit perfectly with the shower theme! From Joy: Last year I was a bridesmaid for my cousin’s wedding and I got the chance to design her bridal shower invitations. 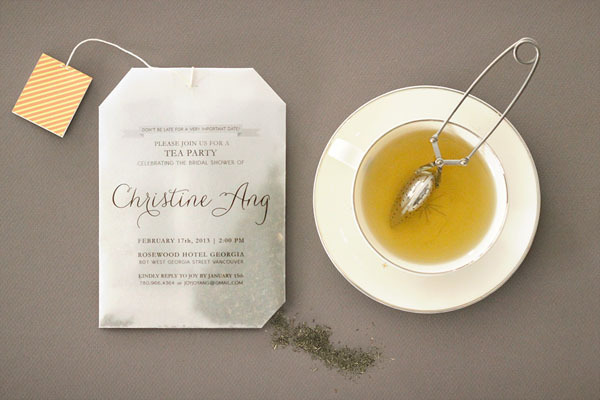 The theme was an Alice in Wonderland tea party, and that’s what led me to thinking about tea bag-shaped invitations. However, I wanted them to have a little more impact on the guests, so I thought it would be really fun to make the invitations hold tea leaves that you could brew and drink. LOVE! My sister is getting married next year and this would be perfect for her bridal shower! My mom has been collecting random vintage tea cups as favors for all of the guests- happy to make it work! WOW! This is a great idea. I love having tea parties so this is so on my to-do list. Yay! This is a great idea! Could you let me know what size paper you used? Where can I find a instructions to fold the paper into a tea bag shape? I’m planning a tea party bridal shower for my sister and this is a fantastic idea! Thanks for sharing! this doesn’t give any information on how to place the wording, cut or fold :/. Hi Robin. This isn’t a DIY tutorial – it’s meant more as inspiration. Sorry it isn’t more useful!